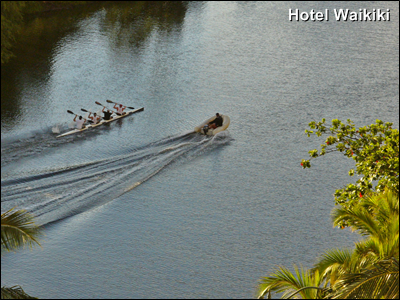 I've rarely get to see 4-man canoes in the naturally carbonated waters of the Ala Wai canal. The photos were taken 6am-ish, in the morning. The person operating the inflatable raft was their coach (photo below). 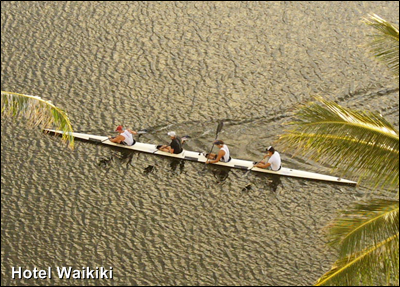 When I happened to look down from the lanai, the 4-man team were engaged in approximately 200-meters all out sprints. None of that row row your boat gently down the stream for this group. Btw, Blogger has been off and on for me this morning, and during some of last night Blogger wasn't running on all cylinders either. I've been using the Firebox browser to do Blogger. Blogger did not seem to like my new version of Explorer. It worked with the old one, but not the upgraded. Weird. I did a post on it, but it'll be coming up in a couple of days. My posts are not updating on folks' readers & links!!! Grrrr! Isn't it against the rules for a powered vessel in the Ala Wai? Kay- I'd like to use Firefox, but I still haven't found a way to export my "favorites" from Opera to it. Cloudia- LOL, I guess I'm not that special after all. Nate- actually, powered watercraft are allowed, it turns out to be just an urban legend. I had the link saved, but I couldn't find it. People usually observe the unofficial rule irregardless. Those boat engines are kinda noisy. I dunno what kind of engine the inflate raft had but that's about the only powered watercraft on the Ala Wai that I didn't hear, at all. By the way - canoes? Nate- I double-checked the term, and it's either "canoes" or "kayak," and 4-man kayak didn't sound much better. Cool view. You must be pretty high up. Hattie- 12th floor. With how crowded Waikiki is, you only have a view if you live on the beach or on the opposite Ala Wai boundary.